Is Detroit America’s Next Big Bike City? The Dequindre Cut. Photo from livinthehighline.com. This week, the League of American Bicyclists released a new report unpacking a trove of bike-related data from the U.S. Census Bureau’s 2012 American Community Survey (ACS). Their report highlights everything from cities with the most bicyclists to highest share of bike commuters to top bike cities by geographic region. Much of the data affirms what we already knew about bike friendly cities such as Portland, OR and Davis, CA and increasingly bike friendly cities such as New York and Washington, DC. But there were a few surprises in the mix. Perhaps most notably, Detroit topped the list of cities where bike commuting is growing the fastest. To better understand why biking is on a rapid rise in Motor City, I reached out to Todd Scott of the Detroit Greenways Coalition. Launched in 2006, the Coalition is a collection of stakeholders working in Detroit to improve biking and walking conditions, primarily by advocating for new and refurbished infrastructure. With that said, Detroit has greatly increased its investments in bike infrastructure in recent years. In 2006, the city had all of 6 miles of bike lanes. According to Scott, the city now has about 130 miles of bike lanes, sharrows, and signed routes. They also have 17 miles of paths and trails. Theoretically there are many more miles of lanes coming in the future. The city’s Non-Motorized Transportation Master Plan, adopted in 2008, calls for nearly 400 miles of bike lanes and other bicycling infrastructure. 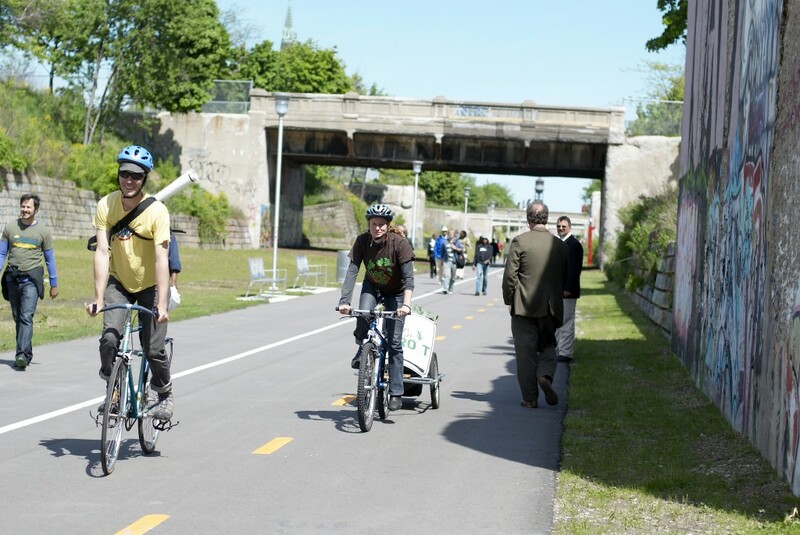 Detroit’s showpiece infrastructure is the Dequindre Cut, a 1.35 mile, below-grade trail built on a former rail line that Scott refers to as the city’s bicycle highway. The Link Detroit project—funded in part by a $10 Million TIGER grant—will extend the Dequindre Cut by another 2 miles and add more bike lanes in the process. Regardless of whether or not the ACS accurately captured the true number of bikers in Detroit, it is clear that bicycling is growing in the city. Scott points to Slow Ride, a weekly, social group ride around the city organized by Detroit Bike City, as evidence. This entry was posted in Advocacy, Cycling Media and tagged american community survey, bicycling growing in detroit, detroit bikes, detroit greenways coaltion. Bookmark the permalink. 3 Responses to Is Detroit America’s Next Big Bike City? Over the past few years, with all the apocalyptic stories coming from Detroit, I started to believe that it had possibly the greatest potential of any North American city to wake up to the tyranny of the private motor car and reinvent itself as a haven of cycling – as opposed to trying to reinvent the Motor City. Looks like the transformation is beginning!